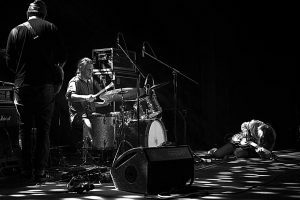 LOTTO are an instrumental trio based between Warsaw and Berlin — Łukasz Rychlicki on guitar, Mike Majkowski on bass, and Paweł Szpura on drums — blending the outer borders of jazz, country, noise, and minimal electronica, through repetitive structures and improvisation, creating a music that is both hypnotising and moving. Mike Majkowski has been touring with Hailu Mergia and drummer Tony Buck (The Necks) since 2013, he also tours as a soloist as well as in other various projects. Paweł Szpura is one of Poland’s most in-demand drummers, playing and touring in a variety of groups (Hera, Wovoka). Lotto have released three albums to date: Ask The Dust (2014), Elite Feline (2016) and VV (2017).